Mandi town buzzed with activities of all sorts with hardly a space for extra footfall giving a tough time for the security to manage the crowd as Chief Minister Jai Ram Thakur reached Mandi at 6.15 PM amidst cheers from the thousands gathered at Seri Manch to welcome the first ever Chief Minister from Mandi district today.While addressing on the occasion, the Chief Minister said that he was indebted to the people for fulfilling the dreams of all residents of the district. He said that there had been Chief Ministerial candidates from Hamirpur, Kangra, Shimla districts, but this time it was the right of Mandi district and the people have assured it.“I never thought that the dreams of the people of Mandi will be realised soon and I will be at the helm of affairs, as Chief Minister. I am happy that a lone independent MLA from Jogindernagar also extended his support after the result”, he said.“I still remember that the Prime Minister called me by name saying, Jai Ram come here to me, you are going to get a much bigger responsibility”, he added. 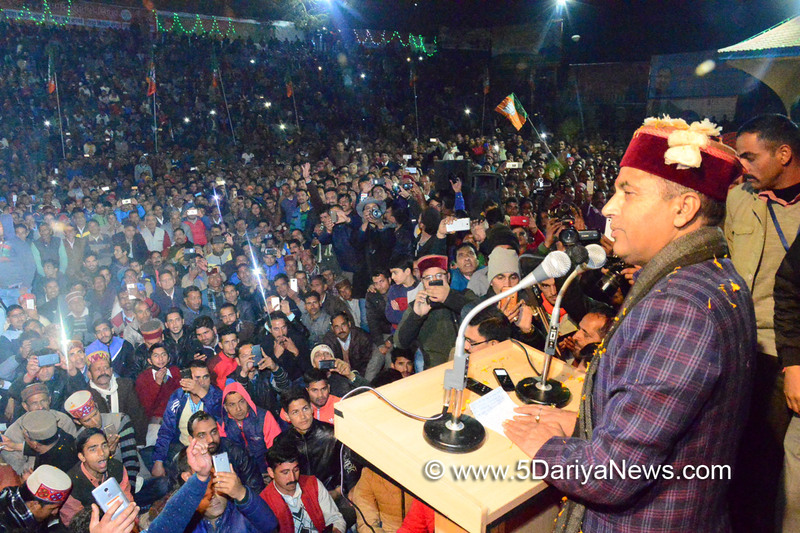 The Chief Minister said that he too was deeply pained at the loss of former Chief Minister Prof. Prem Kumar Dhumal, but the future had something else in store for the people of Himachal, adding further that he was grateful to the people especially those of Seraj Constituency who always motivated and encouraged him.He said today was the time to rejoice and make merry as the Congress was completely wiped out from Mandi district.Irrigation and Public Health Minister Shri Mahender Singh Thakur while welcoming the Chief Minister in his address termed Shri Jai Ram Thakur as 'Dharti Putra', who have risen from a poor family and had touched new heights of success. Several times the leaders of Mandi were denied of Chief Ministership once in 1967 and in 1997 due to some black sheep's in the party. The dreams of the people of Mandi had finally been realised, he said. MPP and Power Minister Shri Anil Sharma welcomed the Chief Minister and other dignitaries present on the occasion. He said though he delayed to join BJP, but he was happy that his joining BJP was a prudent decision. The people of Mandi have kept the honour of Pandit Sukh Ram's family. He said former Union Minister Pt. Sukh Ram was belittled by Congressmen and finally a decision was taken by me to join BJP as my family suffered humiliation at the hands of Congress top leadership. “I am happy that the people of Mandi have shown dust to the Congress party thus ending the anarchy of Congress party and routing it out completely from the entire district, said the Minister, further expressing his gratitude to the people for this.Forest Minister Shri Govind Singh Thakur, MLAs Shri Vinod Kumar, Shri Inder singh Gandhi, Shri Hira Lal, Shri Rakesh Jamwal, Shri Jawahar Thakur, Shri Surinder Shouri, Shri Prakash Rana and other office bearers of BJP were present on occasion amongst others.